1. What’s a tax refund? In Korea, sales taxes are included in the purchase price of each product. If you’re a visitor to Korea (non-resident) and are taking goods out of the country, you may be eligible for a tax refund upon your departure. · Purchases at each retail store must total 30,000 won or more (inclusive of tax). · Goods must be purchased within 3 months of departure from Korea. · Be a Korean student studying abroad for three years or more. Make a purchase of 30,000 won or more at a participating retail store. 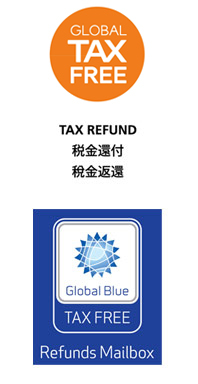 Participating stores are designated by the “Global Blue TAX FREE” or “GLOBAL TAXFREE” logo. Many participating shops can be found in popular tourist shopping areas such as the Myeongdong and Dongdaemun areas. After your purchase, show the sales assistant your passport and ask him or her to issue and sign a refund form. *Make sure to collect a refund slip from each participating store each time you make a purchase. When checking-in at the airport, declare the purchased goods at customs and get the “ALL GOODS EXPORTED” endorsement from customs on your refund forms. ① When getting your boarding pass, tell the airline personnel that you have goods for which you need the customs endorsement. ② Get a baggage tag from the airline personnel and attach it to the bag you want to check-in (don’t check-in the bag yet as you need to show it to customs). ③ Proceed to the oversize baggage check-in counter (located in sections J and D). ④ Present the goods and refund forms to the customs officer at the counter to get approval. ⑤ You can now check-in your bag at the counter. ① Get your boarding pass. ② Present the purchased goods and refund forms to the customs officer at the oversize baggage check-in counter (located in sections J and D or Gate 1, 2, 3, and 4). ☞ For any large items that have already been shipped, present the purchase and shipping receipts to customs. ① After going through customs, proceed to the Refund Counter on the departure floor to get your cash refund. ② If you are using an airport or seaport where there is no refund counter, or if the refund counter is closed, place your forms in the designated mailbox (after receiving your endorsement from customs). Your refund will be sent by post (via money order) or directly deposited in the bank account associated with your credit card. Please allow one or two months for payment. ▪ Cheongju International Airport, Daegu International Airport, Jeju International Airport: Use the designated mailbox as there is no refund counter. ▪ Gwangju International Airport, Mokpo International Airport: There is no refund counter or mailbox, but customs officers will take your refund forms and mail them to the Global Blue Korea office. Use the designated mailbox as there is no refund counter. If there is no mailbox, or if you forget to use the mailbox, please send your documents by post.